Did you know that sugar is grown in Alberta? Since the early 1900’s sugar beets have been grown in Southern Alberta. Every year thousands of acres of this crop are planted and then harvested into over 100,000 tonnes of sugar. Sugar is a necessary staple in everyone’s diet as it provides energy for your body as well as flavor, color, and texture to your food while helping in preservation. sugar content. Typically, a sugar beet will be made up of 17-20% sugar, approximately 1/5 of its overall weight is sugar. irrigation in Alberta. 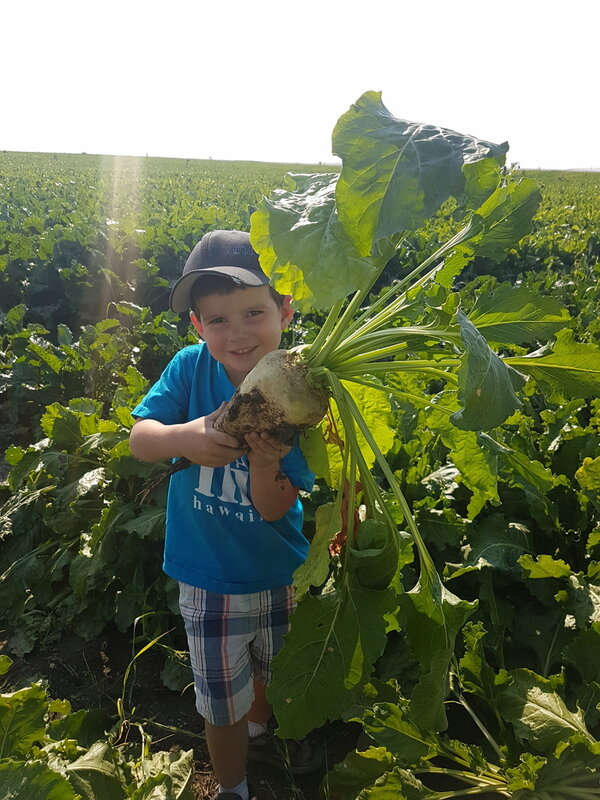 As a tuberous plant, sugar beets can also handle cooler temperatures which can help move the sugar from the leaves to the root and make them extra sweet. A variety of nutritious food items for people and livestock are made from the sugar beet. The broad leafy tops can be used to feed cattle as well as the sugar beets themselves. Once the sugar beet is taken to the factory, the sugar will be extracted from the beet and turned into granulated, liquid, and icing sugar for human consumption as well as molasses and dried pulp pellets for animal feed. Currently research is being done on additional uses for sugar beets and its by products and could include products like deicer, bio-fuel, and ingredients for cosmetics, energy drinks, and so much more! Southern Alberta is home to the only remaining sugar beet processing plant in Canada. This is very important as it is the only source of 100% Canadian Sugar. When you are looking to purchase sugar for your next cup of coffee or baking, make sure to look for the Roger’s Sugar brand with a black stamp on it that starts with the number 22. This will mean you are buying sugar grown in Alberta and supporting over 200 farm families that grow the sweetest crop in the country.